. You need motors for your robot. As you have probably already found out, they come in all shapes and sizes. How do you choose the right motor for your application? Each type of motor has it's own advantages and disadvantages that make it suitable for a particular application. For robotic use, there are basically 3 kinds of motors, DC, brushless DC, and steppers. Servomotors are also widely used in hobby robotics and they are considered DC motors. These categories can be further sub-divided by additional factors such as whether the motor has an attached gearbox, or some kind of sensing to determine the speed or position of the motor. 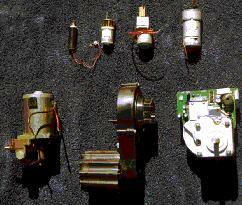 This photo shows DC motors with attached gearboxes. The one at the bottom right is brushless. This type of motor offers precision speed control and great strength for their size. They are generally used in constant speed applications and not reversed. The control electronics are very sophisticated and they are not normally used in robotics. The exception to this would be in spinning the optics for some type of laser navigation system. DC motors, including servos, are the popular choice for most hobbyists. Their ease of use is probably most responsible for this. Merely connect them to some source of DC with appropriate voltage and current, and they turn. Reversing the DC, reverses the rotation of the motor. Using a DC motor with an attached gearhead makes it fairly easy to get your bot moving. The last category of motors used in robotics is steppers. While not offering the speed or torque of DC motors, they still fulfill a valuable role. They offer precise speed and positioning and the control electronics are not beyond the average hobbyist. While steppers propel some small robots, they are more commonly found in positioning applications such as for sensor heads. This photo shows some examples of commonly available steppers. The one in the upper left has an attached gearbox. Some of stepper's disadvantages include an inability to perform at high speed and a power curve that is the opposite that of DC motors. In other words, the faster a stepper is made to turn, the less torque it will have. Any robot builder worth his solder knows you need a good inventory of parts to choose from when Divine inspiration hits at 2 A.M. Motors and drivetrains are no exception and generally the more the better, (within the limits of an understanding spouse). Yard sales, thrift stores, swapmeets, and hamfests provide ample opportunity to collect parts. Even trash day should not be ignored as a neighbor puts a "Power Wheels", or a VCR out by the curb. VCR's are a wealth of parts, not only the motors and gears, but sensors, LED's, and chips as well. Old printers and copying machines are another great source of parts for your "bot". Dot matrix printers contain several stepper motors and driver assemblies, while laser printers use both DC and brushless DC motors. This is also a great way to build up your stock of screws, washers, spacers, and other hardware you'll need while building your robot. Remember, the more motors and gears you have, the more likely it is you'll be able to put together the perfect combination for your robot. And the more parts you get for free, the less your robot costs. In part two, I'll show you how to build custom motors and drive systems "on the cheap", where to find the perfect wheels and how to attach them to your robot. If you've ever looked through the catalogs of surplus houses, you've certainly seen ads like these, taken from the Surplus Center, (1-800-488-3407), catalog number 271-A. How many of you have skipped over the ad on the left because it was an AC motor? 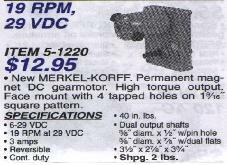 Normally an AC gearhead motor is one half to one fourth the price of a comparable DC motor. But what good is an AC motor on a robot, you ask? Absolutely nothing, I would reply, but the gearbox is. It is not difficult to remove the AC motor and replace it with a DC one. This gives you a lot of control over the finished product and cost savings as well. With this type of motor, the motor shaft extends into the gearbox and normally has a small gear cut into the end of it. We must salvage a portion of this shaft in order to make use of the gear. 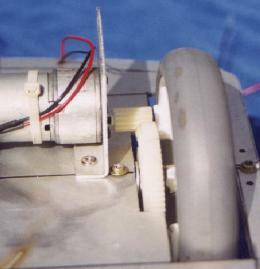 This picture shows a typical modification of an AC gearhead motor. The original motor shaft has been salvaged, cut to length, and attached to the new motor . Then a mounting plate is made to attach the new motor to the gearbox. In the top picture, you can see the finished product, a perfect shoulder motor with a speed of 5 RPM, in excess of 80 inch / pounds of torque, and drawing less than 200ma at 12 volts. Not bad for a few hours work and an investment of less than $6.00. Now let's tackle one a little more common. We've all seen the "Power Wheels" type of car that kids ride down the sidewalk. Many of you have already tried using these motors in your robots because they're cheap, powerful, and easy to implement. But they do have serious drawbacks: they are noisy, power hungry, and have no encoders for feedback. On the left is the un-modified "Power Wheels" motor. On the right, are two potential replacements for the inefficient stock motor. They should be approximately the same physical size and mounting method as the original motor, as well as having the same shaft diameter since you will probably need to use the original gear. This picture shows a close-up of the possible replacements. 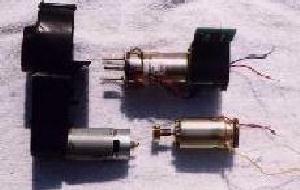 On the left is a Canon 12-volt motor with an optical encoder on the rear. It is a precision made, powerful, quiet, and efficient motor. 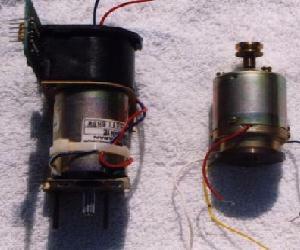 The motor on the right was the capstan motor in a Panasonic VCR. It is also a fine candidate for the job. It has an internal "tach" winding that can be used for speed and distance measurements by your computer. Ultimately, I chose the Panasonic because the shaft was the right size, and there was a flywheel attached to the rear, which could be used as an optical encoder, thus providing maximum flexibility. 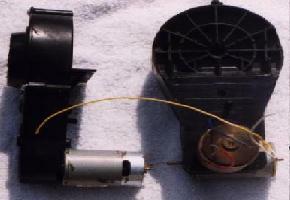 This picture shows the original motor on the left, and the modified one on the right. The stock "Power Wheels" motor is very inefficient, drawing 1.25 amps at 6 volts with no load, and going up to 6 amps under load. After conversion, it draws 125ma at 12 volts with no load, and 1 amp under load. Not only have we greatly improved the efficiency but made it quieter and smoother as well. 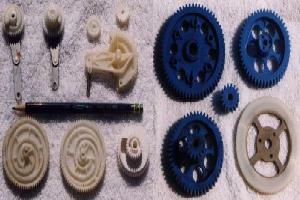 Pictured to the left are some typical gears you might accumulate in your scrounging. All the ones in the left-hand photo have been salvaged from junk VCR's. I make liberal use of these in my own construction, as you will see in the following photo. This is the drive assembly of "Bluebot". It consists of a Colman 12-volt gearhead motor operating at 180 RPM at 12 volts. The tire was salvaged from a baby stroller and the gears are from a VCR. Output speed is 33 Rpm's at 12 volts and 250ma under load. Total cost of the mechanism was less than $1.00. By now you're probably saying, "All this is great for you, you've probably got a complete machine shop at your disposal. What about me, the typical hobbyist with limited tools and abilities? ". I'm here to tell you I don't have any exotic tools or abilities, but I do have a few secrets that make life easier and I'm going to share them with you now. One of the hardest things you encounter when building robots is how to attach stuff to a motor shaft. Take a trip to your local hobby store and buy an assortment of thick wall styrene tubing. It comes in various sizes from 1/16 inch up to about 1/2-inch diameter. While you're there, pick up some J.B. Weld or Epoxy Steel, as well as some regular epoxy. The styrene is strong, cheap, and easy to work with. It can be used for building up motor shafts, connecting 2 shafts of different diameters, or even for spacers. If you want to attach a wheel to the shaft of a gearhead motor, for example, how do you do it? You can probably find a size of styrene that the wheel will fit snugly onto. Once you do, drill out the center, (remember this is tubing), so it fits snugly on your motor shaft. Mix up a small amount of J.B. Weld or Epoxy Steel and apply to the motor shaft. Force the styrene down on the motor shaft and wipe off any excess that squishes out. Once it has set up, (generally overnight), you can attach the wheel using more epoxy. If you use my favorite wheels, ones from baby strollers, this is a painless procedure. What's so great about baby stroller wheels? Where should I begin? They are very strong, as well as being lightweight. They're available in a size and color to match almost any robot. The tire portion works well for most any surface. Being plastic, they are easy to work with as far as enlarging the center hole if needed and attaching them with epoxy. And the best reason of all, THEY'RE CHEAP and AVAILABLE. In part three, we'll be comparing the different motor controller chips on the market and maybe building a couple of our own. To save on loading time, please click the above to go to Motor Basics Three.